I don’t know what it is about staying at my parent’s house, but my culinary ambitions really come out. Fresh pasta from scratch, why not? Dumplings with a chicken, mushroom, kale and pepper filling?, of course! Really, I ventured into dumpling town because I found a dumpling maker in one of their cabinets. It’s a little half-circle contraption that folds in half and crimps the edges of the dough for really easy dumpling assembly. It was like a new toy to play with! The filling is a mix of chicken and vegetables, along with some asiago cheese. Boiled lightly once they were ready, I tossed them in some brown butter with fresh oregano. And then I devoured everything in this photo. I have a problem with doing this. Prepare the filling first so it has time to cool before you put it in the dumplings. Start by mincing chicken breast and vegetables into very small pieces, no larger than 1/8″. In a large skillet, warm the olive oil and add in the onions, red pepper and kale. Saute for 3-4 minutes until onions become translucent. Add mushrooms, garlic and chicken and saute for another 2-3 minutes until chicken is cooked through and mushrooms are soft. Just before turning off the heat, add fennel seed, oregano and thyme. Season to taste. Set aside to cool. Begin preparing the dough. In a large bowl, place the flour and salt, creating a well in the middle. Add the egg and oil and use a fork to blend in the wet ingredients. As the dough becomes shaggy, add the water slowly and mix to combine. Once dough comes together in a shaggy ball, use your hands to knead it into a shiny round ball, about 2-3 minutes. Set aside for 10 minutes with a towel covering the bowl. Once dough has rested, rough out onto clean counter top or cutting board into sheets about 1/8″ thick. For medium sized dumplings like those pictured, cut about 3″ round circles of dough using a biscuit cutter or cookie cutter. The edge of a glass works just fine. Now you’re ready to add the filling. Before putting into the dumplings, add the asiago cheese to the cooled mixture and stir to combine. Then, place about 1 tablespoon of filling in the middle of your dough and fold over, pinching the edges of the dough to seal. It’s important you create a tight seal on the edges of your dough so they don’t open up in the water. Continue cutting and re-rolling sheets of you dough until you’ve used it all. 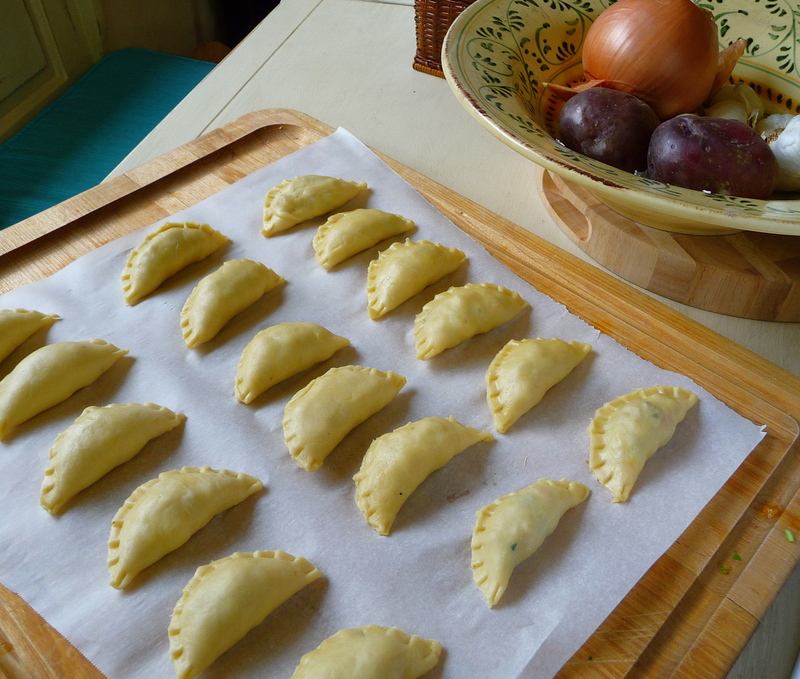 Let prepared dumplings rest on a sheet of parchment paper until ready to boil. Heat a large pot of water with a good sprinkle of salt. While the water comes to a boil, start your sauce by melting 1/2 stick of butter in a saucepan over medium low heat, so as not to burn the butter. The butter will slowly brown and smell nutty. At this point, reduce heat to low and add fresh oregano to flavor the butter. Leave on very low heat, your water should be boiling now and ready for the dumplings. 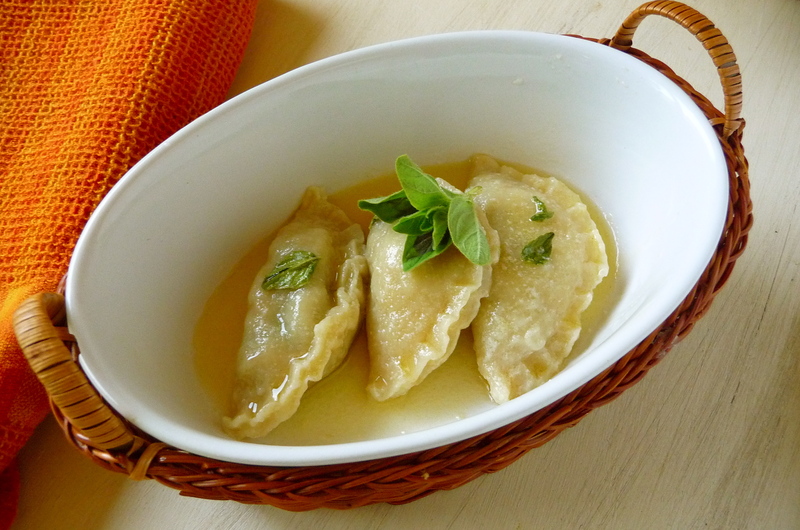 Place the dumplings in the boiling, salted water one at a time so they don’t stick together. They will need about 6-8 minutes to cool. They’re done when the puffy sides of the dumplings feel soft, not hard, and the edges bubble a little, without becoming mushy. Use a strainer to get the dumplings out of the water and move directly into the warmed brown butter. Saute the dumplings to coat, remove from heat and begin plating. Some more fresh oregano can be placed on top for serving.